If you keep up with local Austin foodie-news, you’ve likely already tried (or at least heard of) South Austin’s hot new Vietnamese restaurant with a French café feel. 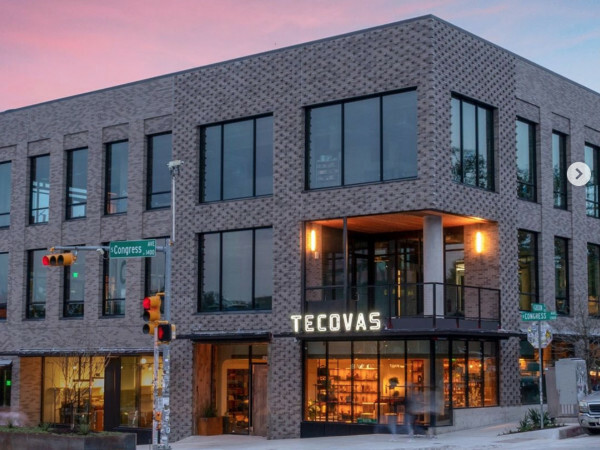 Perched on the southeast corner of Elizabeth and South First Streets (in the former location of hippie-haven Bouldin Creek Cafe) is Elizabeth Street Café, the latest restaurant adventure helmed by Larry McGuire and his partner, Thomas Moorman. Situated along the booming stretch of South First St., Elizabeth Street Café is also in good company. 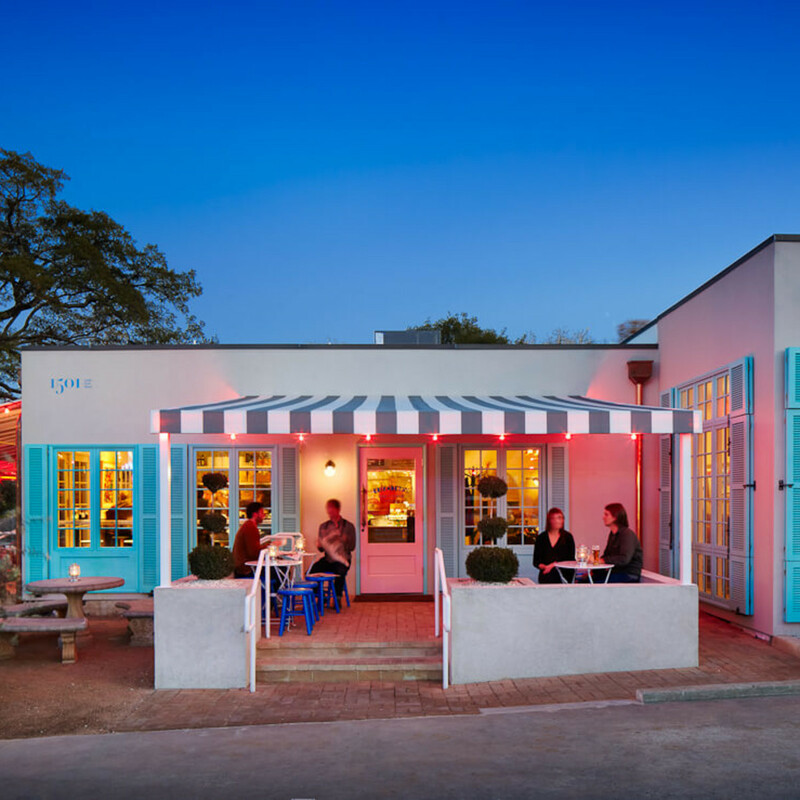 With fellow new-to-the-scene Lenoir having opened its doors in January and the new Bouldin Creek Cafe just up the road, not to mention J. Mueller’s crowd pleasing barbecue trailer located directly across the street, it seems like this area is stepping into the limelight. But how did McGuire and Moorman decide to open a Vietnamese café (with a decidedly French twist) as the follow-up concept to Lambert’s and Perla’s? And although Elizabeth Street Café is a far cry — food-wise — from McGuire and Moorman’s previous two ventures, it boasts the same meticulous attention to detail and thoughtful design as Lambert’s and Perla’s. Its cool gray façade is accented by slightly muted shades of fun, punchy colors. Its logo sign is a linear puzzle that begs further inspection by signaling, ever-so-subtly, that something interesting rests just beneath its neon glow. 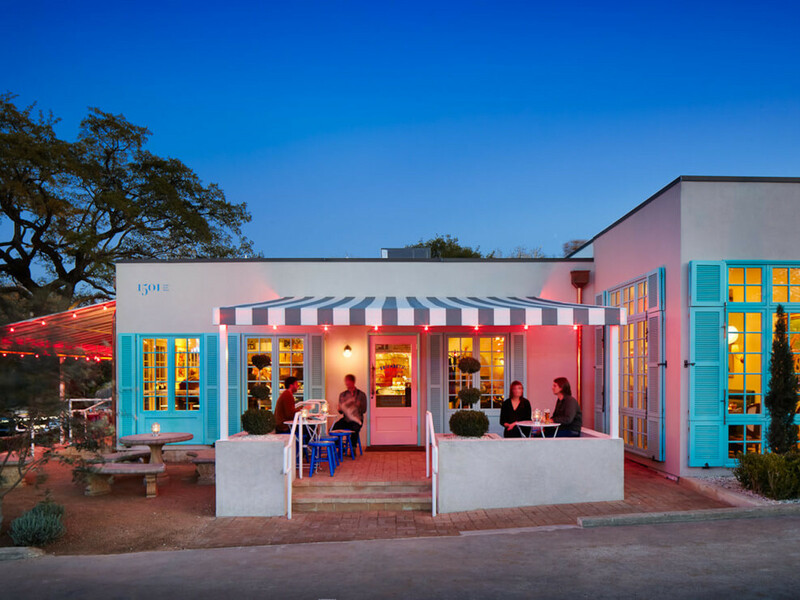 After you steal a glimpse of the bustling interior through the numerous tall turquoise windows (with operable shutters), a bubblegum pink front door welcomes you inside the “South Austin French-y Vietnamese” café. Part of the beauty of the Elizabeth Street space is that it manages to cater to a range of dining experiences — the casual bar-stool-at-the-counter meal, the cozy bistro-feeling meal, the communal share-a-table meal and lastly, the sun-drenched outdoor meal. Elizabeth Street’s corner position affords it the luxury to welcome patrons to not one, but two patio areas; you can perch out front on one of the many bright blue stools to enjoy a coffee (or adult beverage) or round the corner for a spot at one of the few lucky tables with outdoor waitress-service. The front outdoor area has also proved useful with the evening spillover crowd since it’s the ideal place to sip a cocktail beneath the restaurant’s striped awning while waiting for a table. A side-note however is that although Elizabeth Street is “beer and wine only,” they do offer a few inventive “champagne punch” concoctions, plus a selection of sake. Stepping in from the outdoor area, you enter into an environment that can, at first glance, overwhelm with its designed details. With the coffee bar and counter area to the left, an open view into the kitchen straight ahead and the seated dining area off to the right, there are plenty of visual distractions to keep your mind off a potential wait for a table at the popular neighborhood spot. “We focused on giving it that French café look while integrating that feeling with aspects from colonial Hanoi … a mix of French antiques, tea house wallpaper, Vietnamese and local art, as well as reclaimed French light fixtures that Tommy [Moorman] found on eBay,” says McGuire. While Foda Studio masterminded the restaurant’s branding, the interior design was handled entirely in-house with Margaret Vera, Joe Holm and builder Jon Williams. Local architect Jamie Chioco also contributed his design skills to the project via construction plans and drawings. “Our team had a lot of fun designing this restaurant. We had a good buying trip in New Orleans where we picked up the Louis Chairs, antique bentwood chairs, hostess stand and the cool bird cages,” notes McGuire. The combination of black and white checkered marble floors, oak hardwood floors, and carerra marble countertop create the ideal backdrop for the bright turquoise Thonet chairs and the faux crocodile booths and barstools (both of which McGuire had custom made in San Antonio). Additional artistic touches lend a decidedly unique flair to the space as well. Even the waitstaff uniforms add to the playful mix of color and patterns and were a collaborative labor of love from people in the restaurant’s extended family. The women’s floral wrap dresses and the men’s wrap jackets were designed by Ryan Smith, Elizabeth Street’s Front of House manager, and his wife. 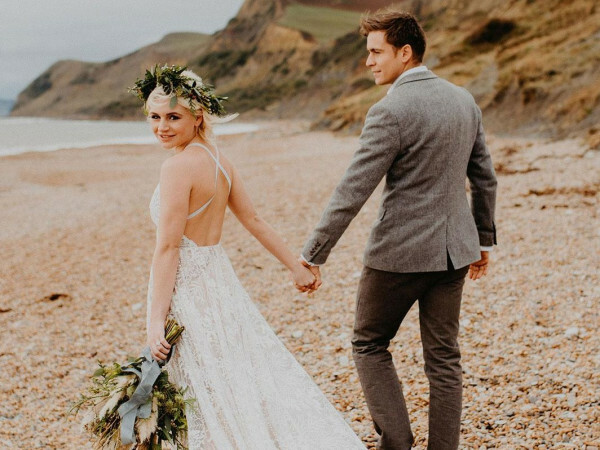 Because longtime Lambert’s bartender Chris Savitierre and his wife also run a tailor and alteration business — Mr. & Mrs. Sew It All — they were tasked with creating and fitting each waiter and waitress for their custom uniforms. As for footwear? McGuire looked to his own style for a little inspiration. Décor and design aside, Elizabeth Street Café is finding quick success with its varied menu and breakfast/lunch/dinner options. But don’t forget: the café also serves as a prime pitstop for your early morning coffee — from Portland’s Stumptown no less. So go ahead, take a seat at the carerra marble counter and order a French donut while you take a moment to soak in the details and plan your return for a sumptuous meal later that day.